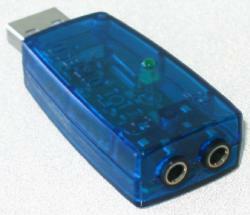 We offer quality USB Audio Adapters which allow you to add MIC IN and LINE IN ports as well as provide audio out ports. Our UA580 USB audio adapter not only provides both the MIC IN and LINE IN ports, it also provides true 5.1 channel audio output. That means you can set up a surround sound environment with 2 front channel speakers, 2 rear channel speakers, a center channel and a subwoofer. If 5.1 channel audio is more than you need, you can set it up for just regular 2 channel audio as well. Or perhaps you just need a MIC IN and want to create virtual 5.1 audio (sounds like 5.1 audio, but really just uses 2 speakers or a set of headphones)? If so, check out our MUSIC-FAIRY and MUSIC-FAIRY2 products. 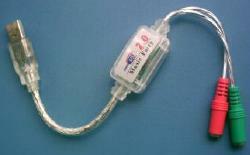 Other USB adapters we offer include USB infrared and USB IDE converters. 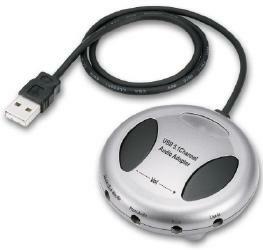 Not only does this small, light weight USB Audio Adapter / USB Sound Card add an audio output port to your computer, but it also turns any regular stereo output into virtual 5.1 channel audio! In addition, it adds a MIC IN port to the computer. Just plug this small, light weight USB audio adapter / USB sound card into your USB port for instant 5.1 channel stereo surround sound capability. (Also works fine for a 2 speaker stereo setup.) Includes MIC IN and LINE IN ports. Play audio wirelessly from your computer, and use a MIC wirelesses back to your computer. GWC AA1570 USB 7.1 channel external sound card is the easiest way to upgrade your 2 channel PC/Mac audio to 5.1 or 7.1 channel surround sound!